Winter Sowing: Find the best gardening method to rid the winter-time blues. Learn how Winter Seed Sowing can provide numerous amounts of seedlings for your home and garden weeks sooner than traditional methods. ...And They Thrive Like This! Most people haven't heard of wintersowing, let alone ever tried this neat and fun method. In a way, it throws many of the text book style planting methods out the window. But... that's what makes it a little more fun in my opinion! Winter Sowing is a method of planting seeds in see-through plastic containers. Those containers are placed outside in the winter. Being placed in the transparent container, the seeds are in what could be thought of as a miniature greenhouse. The effect: Seeds sprout so much earlier than normal. Which means flowers are ready for planting weeks earlier than traditional methods. Have a question on Winter Sowing? Ask Here! Some of the things that make this method so different are as follows: Most areas start their winter sowing on or after the Winter Solstice. Yep... right in the dead of cold weather! No matter what snow, ice, freezing rain, thawing then freezing again, then raining, then snowing, comes your way, those seeds Will Prevail! They're doing what they basically were meant to do. Fall to the ground, await the passing of winter (and all that winter entails), then sprout in the Spring. I've even had, on several occasions, seeds to sprout in the containers, then a horrible snow storm comes our way and completely covers the containers with inches of snow. Should despair set in? Well it should, but it doesn't! Somehow, some way, they survive in their little mini-greenhouse. Which that is basically what they're in. A little greenhouse, that keeps them safe. That same 'greenhouse', that helps them through the cold winter, also is what makes winter sowing so great. Again, with the greenhouse, the seeds sprout earlier than normal, which means you'll have flowers ready to be planted, a lot earlier than you ever have before! Ready to jump on board the Winter Sowing Train? The container can be anything of any size. However, there are a few things to keep in mind when choosing the right container for your needs. It has to be see-through for the sunlight to make its way to the soil. You have to have access to the inside of the container in order to pour in soil. Then be able to put the lid or top back on. These all can work, but would have to have a depth of 3-4 inches in order for an adequate amount of potting mix to be applied. Ventilation holes drilled or poked into the top of the lids would also have to be applied. The 1 gallon milk jug or 1 gallon distilled water jug. Why? You never have to add a ventilation hole on top. Just remove the cap and you're done! Sometimes throughout the winter or early Spring, moving your containers for more or less sunlight is required. If one had a heavy container filled with potting soil, then a move of that container could be very difficult! If you decide on milk containers, there are also two things to keep in mind. The milk jugs need to be properly sanitized before proceeding. I advise washing out all traces of milk with HOT soapy water. Rinse the container VERY, VERY well with cool water. Don't forget to discard the jug cap. We'll never use it! Also if using milk containers, please make sure that the container is transparent. If the jug is opaque (meaning it's not letting any or very much light in), then don't use it. It won't allow enough sun to reach the soil. A typical milk jug, which is a somewhat clear plastic, is the normal jug you'll find on most store shelves. 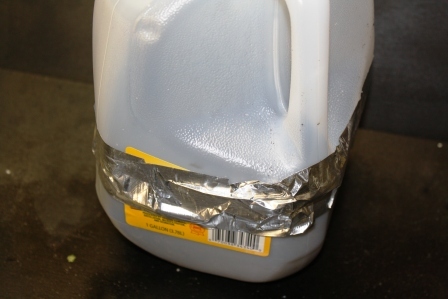 Continuing as though a milk jug or distilled water jug is being used, take a piece of Duct Tape and place it on the bottom of the container. (The bottom of the jug is less likely to fade, smudge, etc.) You'll need to write the type of seed you're planting on the tape. Please use a permanent marker. The weather over the winter can remove your much needed labeling information. I always use a letter system in addition to the actual seed name. I write down the letter in a small notebook with the name of the seed by the letter. That way if something gets smudged throughout the winter, I can look at the bottom of the container and hopefully see, at least, the letter. After the jug has been prepared, next up is drilling drainage holes in the bottom. I normally drill four 1/4" holes in the bottom. If you have only a smaller bit, drill a few more holes. If you have only large bits, you can drill only two or three holes. Next up is cutting open a hinge style lid for the jug. You'll need a pair of scissors, a box cutter, or something that will cut through the plastic. It might be a good idea to trace a line around the jug so as to have a guide for making the cut. It's not necessary, but advisable. When making the cut, only cut around 3/4 of the jug. You'll want to keep the back side of the container intact. That will create a hinge. You'll then be able to close up the jug more easily when the time comes. Now that the jug is cut open and drainage holes are in place, it's time to add potting soil. 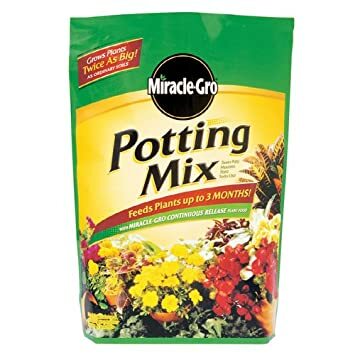 I always use Miracle-Gro Potting Mix. Don't use the Moisture Control variety. Fill the container up to the top of the sliced section. That should equal somewhere around 4" of potting soil This will give your seedlings plenty of room to grow their roots as the Spring starts. Our next step is to moisten the soil. Take a garden hose attachment that has a mister or shower setting, and run it over the potting mix until is is saturated. Allow the jug to drain for a while. How long? Just wait until the draining water coming out of your drilled holes has slowed down to a trickle. Using a shower setting on your water hose is best. Several of the other settings will make indentions in the soil due to a overly high volume of water dispersing from the nozzle. Now for the fun part! Scattering the seeds. Unlike most sowing methods, which call for seeds to be added to a container in numbers such as 2-3 seeds per container, to winter sow, you use a scatter method. Take a handful of seeds and cover the entire top layer of potting soil. (You can at least try to scatter them evenally, though.) Yep, no measuring, no counting seeds for a certain size container. I've done it this way every year, and sure enough it works great! In the Spring, there'll be a whole mess of seedlings sprout up. Once you have your seeds scattered atop the soil, using your fingers, press the seeds into the top layer of soil. Just to kind of settle them into the potting mix. Not a lot, just a little! You'll then need to cover the seeds with more potting mix. Here's the rule I use: If the seeds are tiny seeds, I scatter enough potting mix to lightly cover the seeds... and that's it! If the seeds are large seeds, like Nasturtium, I'll add an amount of soil that is equal to the thickness of that seed. Now it's time to close up the container. I use Duct tape. It will hold the container in a closed position all winter. I've also used packing tape with great results. Whichever you use, attach the tape over the entire seam of the jug. That's it! Your wintersown container is now ready for the winter. Place the jug in a location that will receive a few hours of sunlight. Be mindful of where you place the container regarding pets or animals. If the structure is compromised, then the container is ruined. You never need to water them. Only after the break of winter starts (when warming trends start to move in yet it still freezes at night) is when you need to check the moisture inside the container. If you can see condensation on the inside of the container, you can leave it as it is! If you don't see any, lightly water the container... then check it again the next day for condensation. As you seedlings become bigger and bigger and the days warmer and warmer, you'll need to allow more air to the inside. Achieve this by opening up the hinged section of the jug, or by cutting open holes/slits in the top of the container. By the time Winter weather is over, the top of the container should be completely removed, and the seedlings will be free to grab all the sunlight they need along with total exposure to the elements. Yep, no Hardening Off with wintersowing! If you need an answer to any kind of question on wintersowing, ask it here. Too Warm For Winter Sowing? Winter Sowing: To Cap or Not to Cap? Winter Sowing: We get a LOT of snow! When do I start this process? When to Start Winter Sowing in Zone 3?